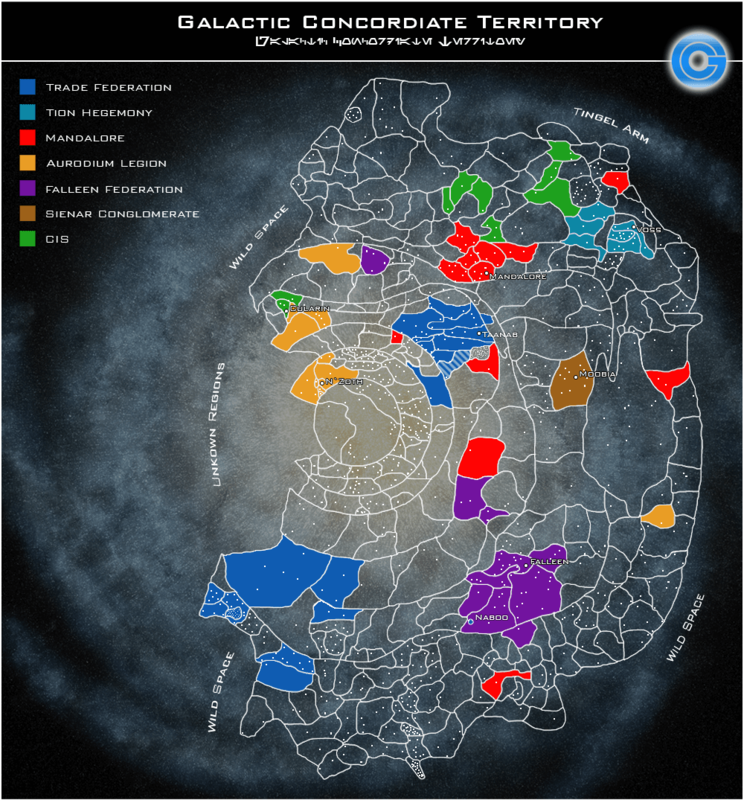 With the merger of The Avance Coalition, Trade Federation territory doubled in size. 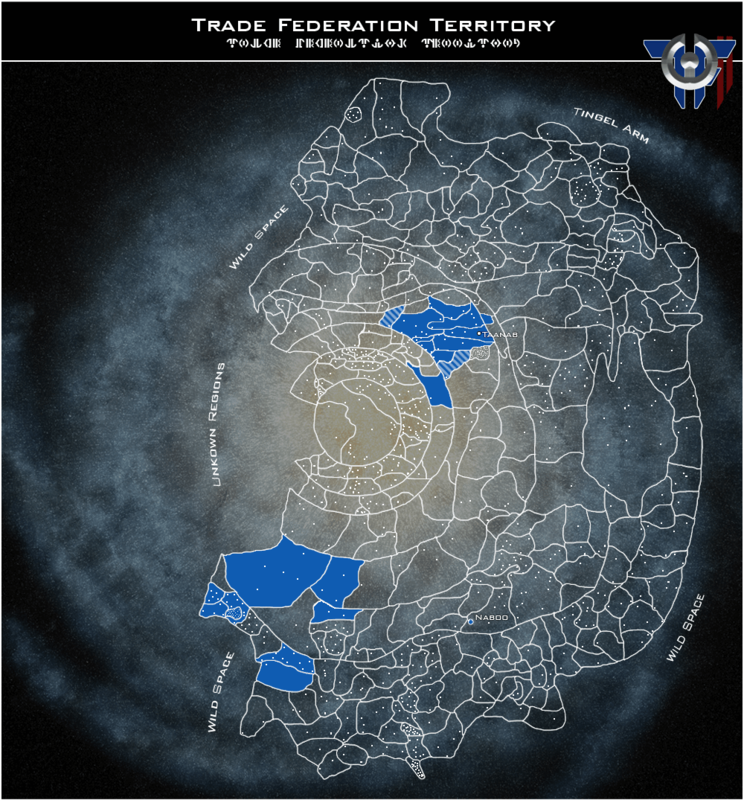 To accommodate the colossal size, Trade Federation territory has been split in half. The older territories in the northern sections of the galaxy are referred to as the Northern Regions. The former TAC territory is referred to as the Southern Regions. Territories outside of the two regions are referred to the Extended Territories. The Northern Regions are situated almost completely within the Inner Rim sandwiched in between Imperial, Hapan and Mandalorian territory. Running through the middle of the territory lies the important Perlemian Trade Route. A vital trade super-hyperroute starting at the galactic center of Coruscant and ending at Quermia. The territory is made up of 11 sectors, over 34 systems and a population totaling over 300 billion citizens. The region is home to the Trade Federation Capital System of Taanab. The Southern Regions are on the far side of the known galaxy. The territory is made up of 8 sectors, over 55 systems. Each region has a military fleet stationed within responsible for policing and protecting the region as well many thousands of support ships, stations, facilities and logistical support units. Within each region are a number of worlds who are known as Purse worlds. Purse world is a term for important Neimoidian worlds adapted by the Trade Federation. These worlds are vital to Trade Federation operations and considered the most vital of all Trade Federation planets. These systems are not part of Trade Federation's territory.